This is Kia's new sporty GT fastback - check it out! 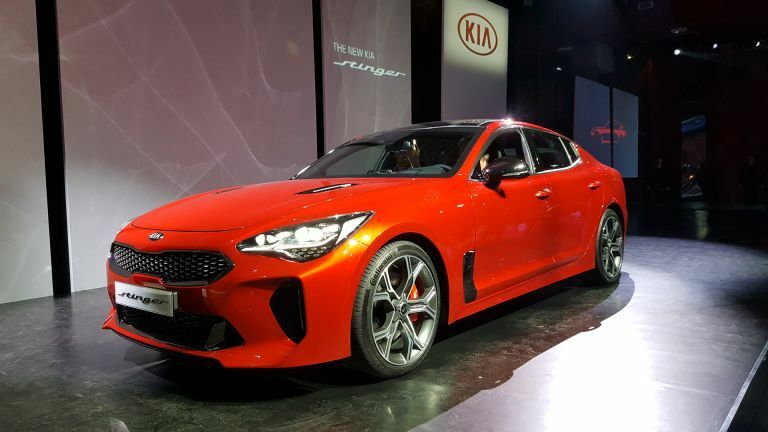 Kia has shown off its Stinger GT fastback sports car and announced models it will be launching in the UK. We got a closer look. This reveal follows the initial unveiling at the Detroit Motor Show and now comes with new European engine details. As you can see the Stinger GT is nothing like any Kia before it. This is a rear wheel drive, front engined gran tourismo which has been designed to put the pleasure in driving. Under that air intake-filled shapely hood is a top-end option of a 3.3-litre V6 turbocharged engine capable of 370bhp for a 0-62mph time of 5.1 seconds. So this is up against the likes of the Audi A4 or BMW 3 Series. Continuing that sporty spec the Stinger uses a lightweight high-strength steel chassis for a rigid ride but with reduced vibration and noise for comfort too. Close the door and the silence of that quiet cabin is immediately obvious. In a Kia first the suspension damping is adjustable with a new Dynamic Stability Damping Control system that should offer the best cornering. There are five driving modes that the car can be set to. Those 18-inch alloy wheels might not look as big as the concept car this was based on but the rest of the body has been adapted to make them look equally impressive. Inside the car there are plenty of top spec options like lane assist, heads-up display, a central control screen unit, heated and cooled seats and more. Kia hasn’t announced pricing yet but it’s rumoured to start at £28,000 and go all the way up to £50,000.